Here is a hand carved and hand painted Tiki totem featuring a Big Kahuna sign. This Tiki totem features hand painted and hand carved Hawaiian plumeria flowers great piece of art. 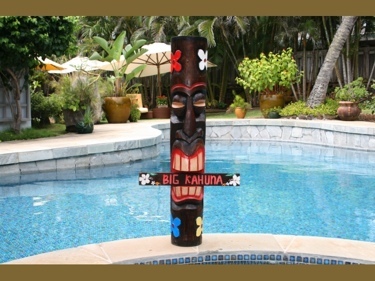 This Tiki pole measures 39 inches tall and is made of pine tree. GREAT HOME OR POOL DECOR!